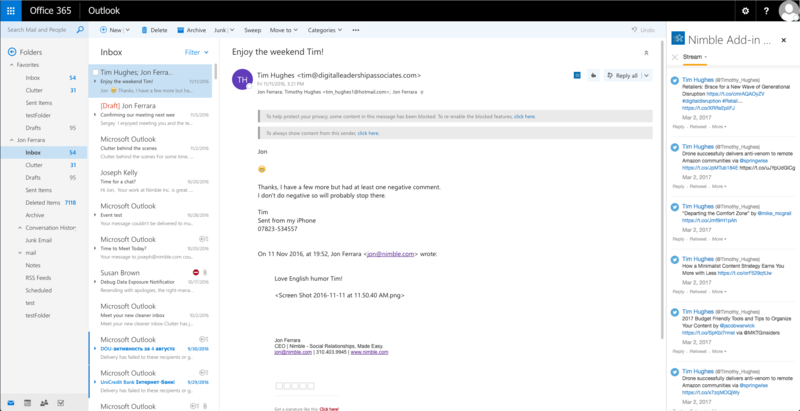 Select your Office365 or Outlook.com Inbox and click on the "Store" icon. 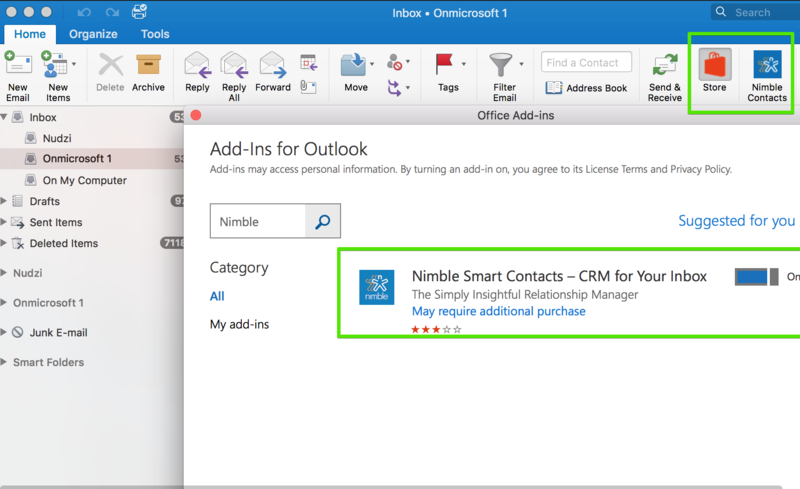 Under "Add-Ins for Outlook", type in "Nimble"
Select Nimble and switch the add-in to "On". 2. 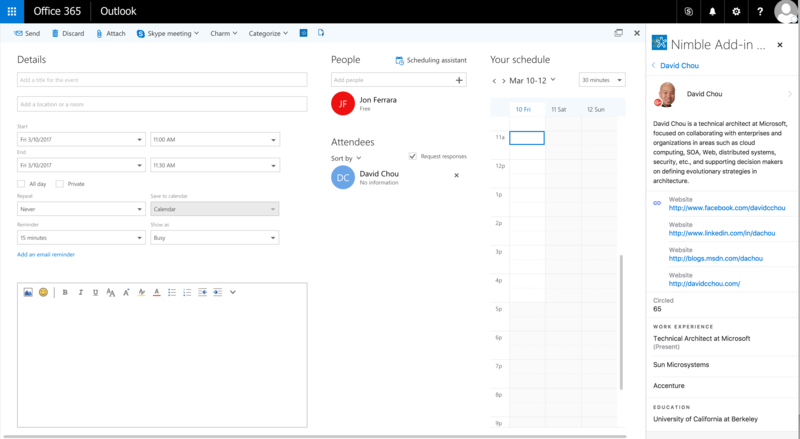 Select "Add" to install Nimble to your Office 365 account. 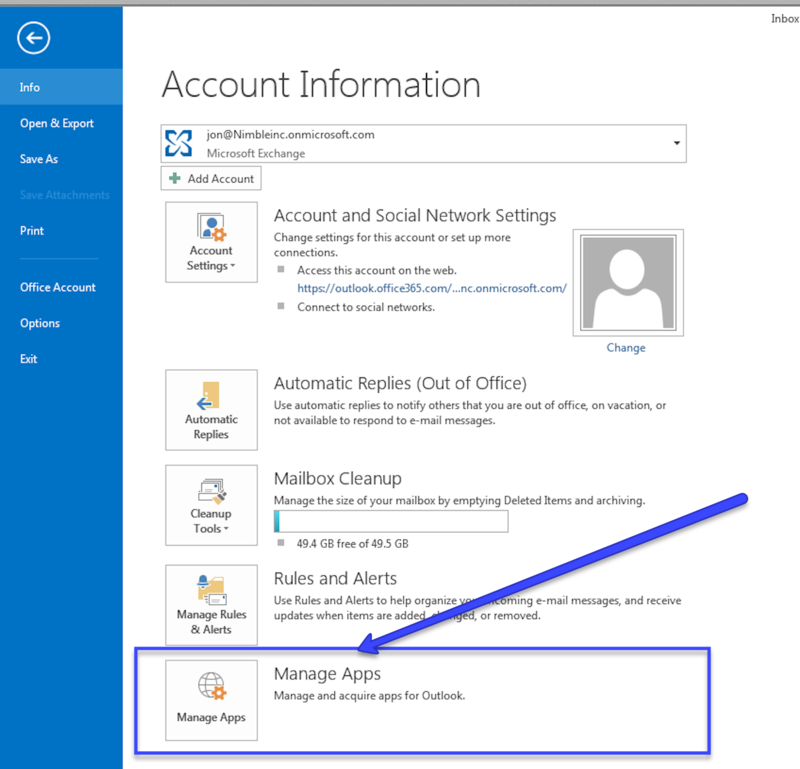 Once installed, open an email in the Outlook Web App and select "Nimble App for Outlook" to authorize into Nimble. The Add-In will appear alongside your Outlook Calendar and Outlook Mail in the Outlook Web App. 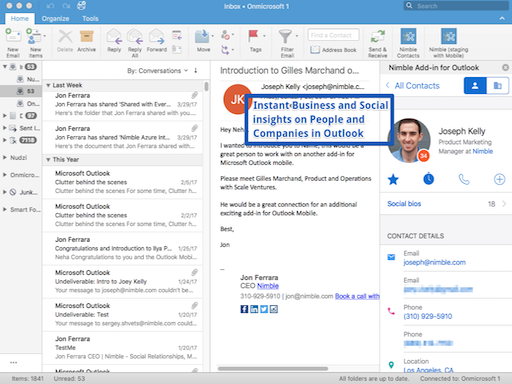 Open Nimble alongside your messages to follow up quickly with rich contact details. View the Twitter streams of people and their company alongside your inbox. 1. In Outlook 2013, go to File >> Manage Apps to bring up the currently installed apps in Outlook 2013. 2. 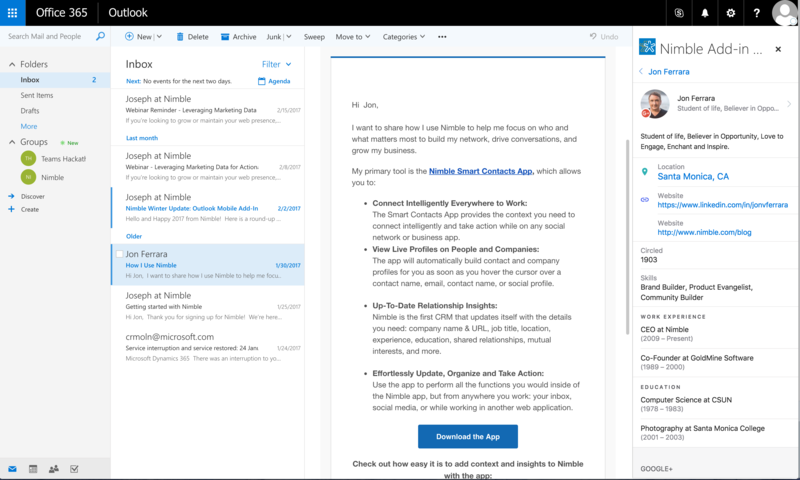 Verify that the Nimble App for Outlook is installed. If not, select the "+" icon to visit the Microsoft App Marketplace. 3. 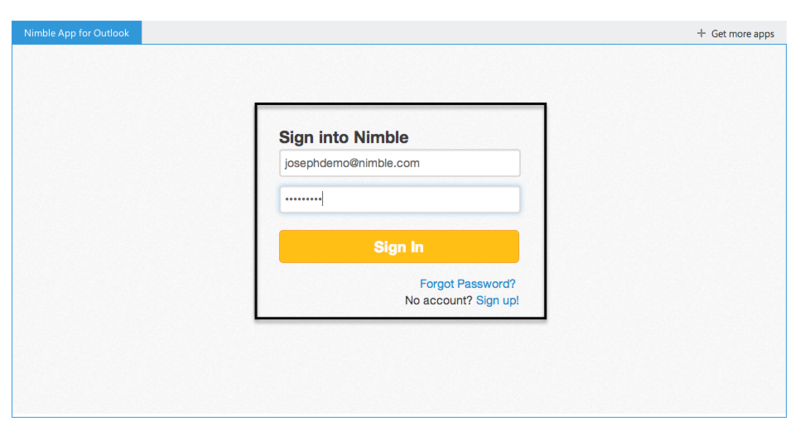 Once you have added Nimble to Office, you will need to authorize your Nimble account from an email thread in Outlook. 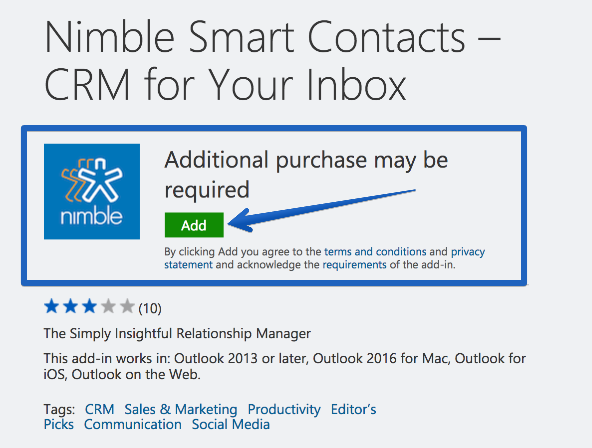 Select "Nimble App for Outlook" while in an email thread to authorize your account. 4. Once you are authorized, you will see Nimble contact information on an email thread, and have the ability to add a contact to Nimble. Help! I'm Not Able to See The App in Safari! 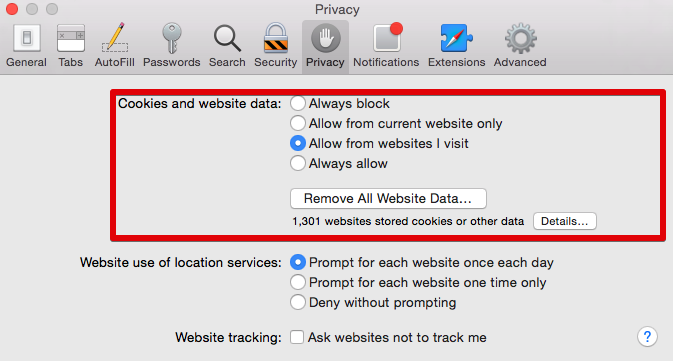 If you're unable to see the app while in Office365, it's because of your stored cookies in Safari. 3. Open another browser tab, visit www.nimble.com to store our site in your cookies. 4. Go back to the Office365 tab, refresh the page, and the app will load.